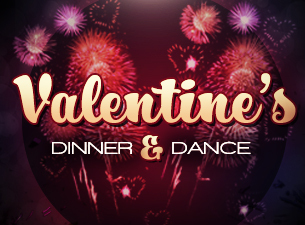 Celebrate Valentine’s Day at La Palapa Griega a special show from 5:00pm – 8:00pm with Sensa Nova. And fried bananas for dessert (click on the image to the left for the full menu). The dinner and show costs 540 pesos per person. Reservations recommended by calling 226-1888, or visit the restaurant. 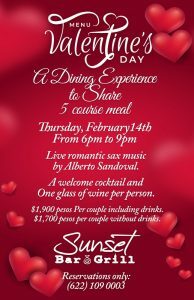 Celebrate Valentine’s Day with a spectacular dinner at Sunset Bar & Grill. Enjoy a 5-course gourmet meal with drinks (click here for the full menu) from 6:00pm to 9:00pm. 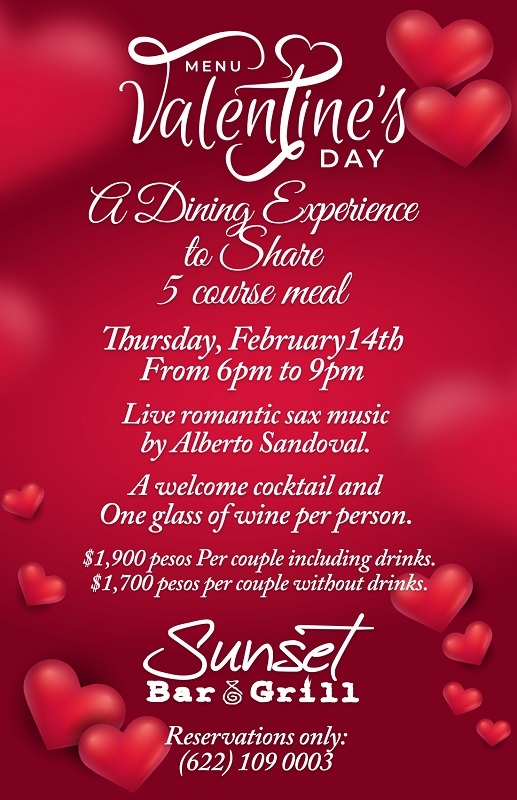 Live Romantic Sax music by Alberto Sandoval. 1900 pesos per couple with drinks or 1700 pesos per couple without drinks. 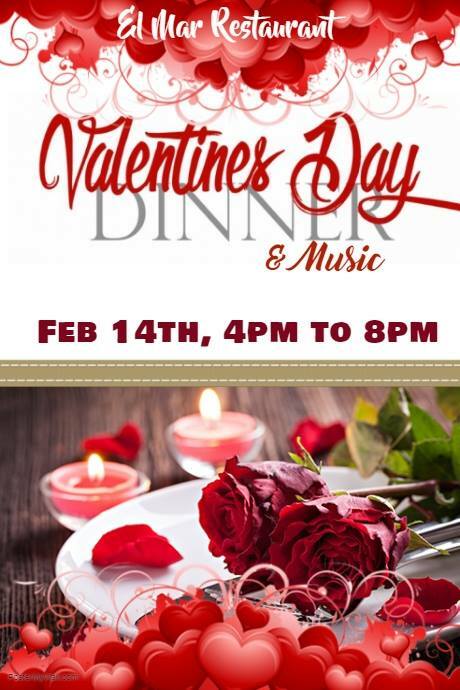 Enjoy a romantic evening at Blackie’s. Blackie’s will be serving Rib Eye and Shrimp Guillermo stuffed with crab and wrapped in bacon for two with two glasses of wine for only 850 pesos. There will also be other specials for one that will include a glass of wine (click on the image to the left for the full menu). 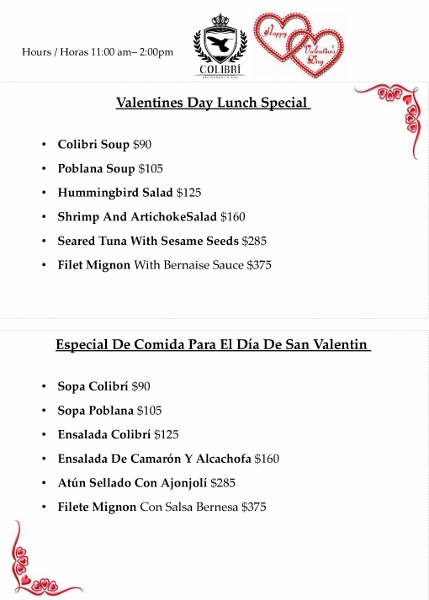 Celebrate Valentine’s Day at Maria’s Restaurant with out fish special. Cooked with Maria’s recipe in a white wine sauce. Includes green beans, carrots, zucchini and grilled tomatoes and garlic bread. Also includes a glass of wine for only 250 pesos. All woman will receive a rose with their meal. Compliments of Maria’s for Valentines Day. We will also have 2 for 1 Margaritas. 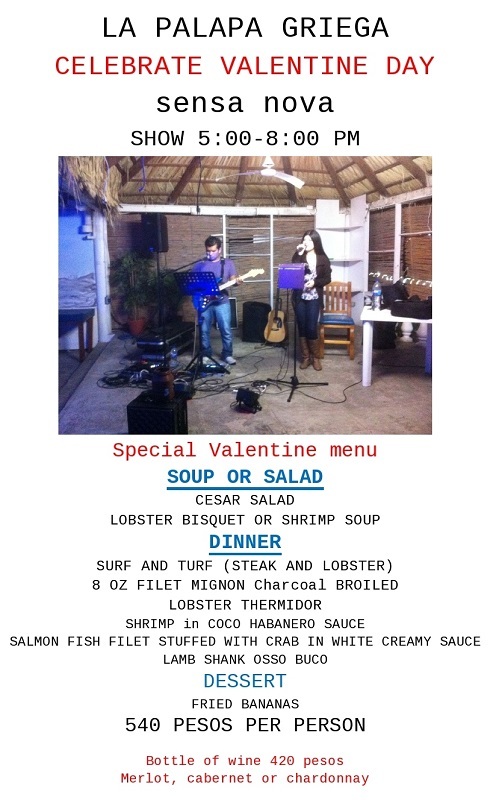 Tortuga’s Restaurant & Bar will be serving a delicious menu for 645 pesos per person. 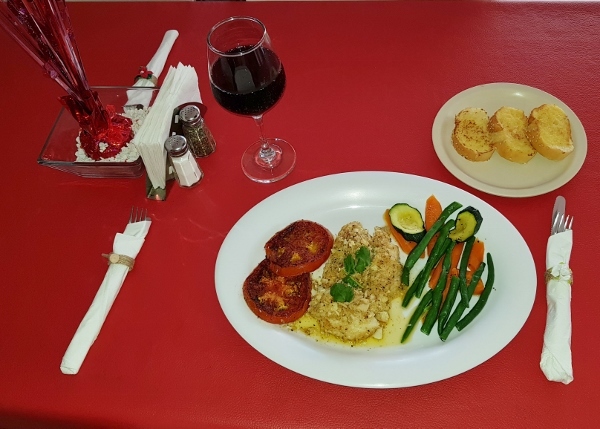 Starter of flavors of Japan or roasted tomato Veloute, followed by a choice of pork fillet Mayan style with sides or lime and pepper crusted seabass with sides and dessert (click on the image to the left for the full menu). 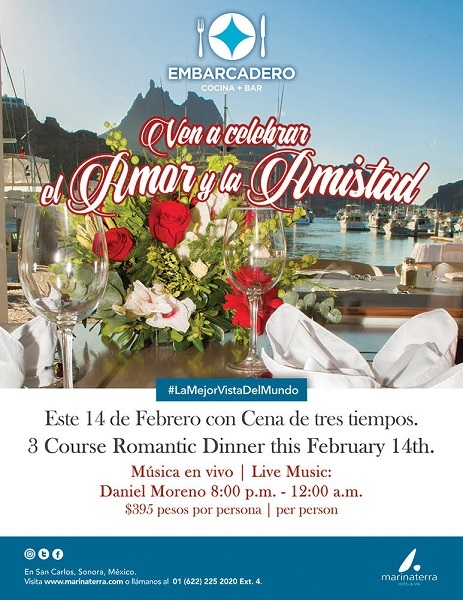 Embarcadero Cocina + Bar will be serving a delicious and romantic 3 course meal for 395 pesos per person. And there will be live music with Daniel Moreno starting at 8:00pm. For reservations, call 225-2020 ext. 4. 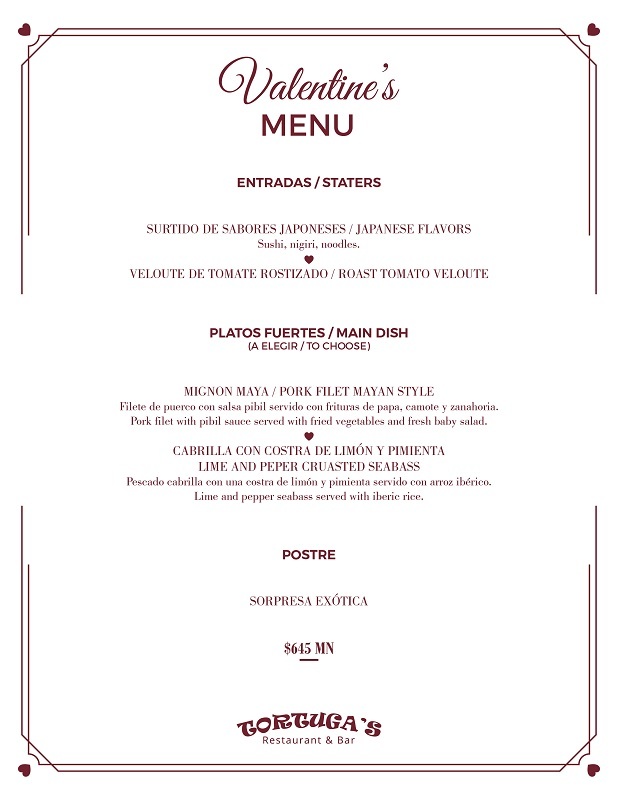 El Mar Restaurant will be serving a special Valentine’s dinner from 4:00pm to 8:00pm. To set the romantic mood, there will be live music. 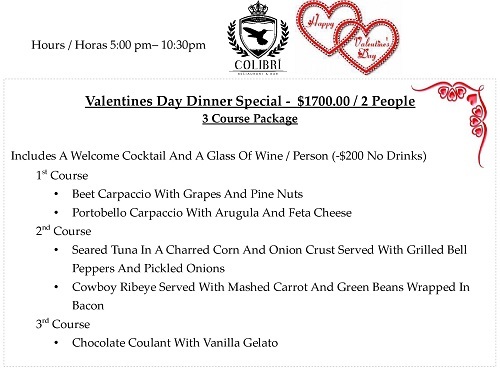 Come and celebrate Valentine’s Day the whole day at Colibrí’s. Enjoy breakfast specials including Eggs Benedict and Hummingbird Hotcakes. 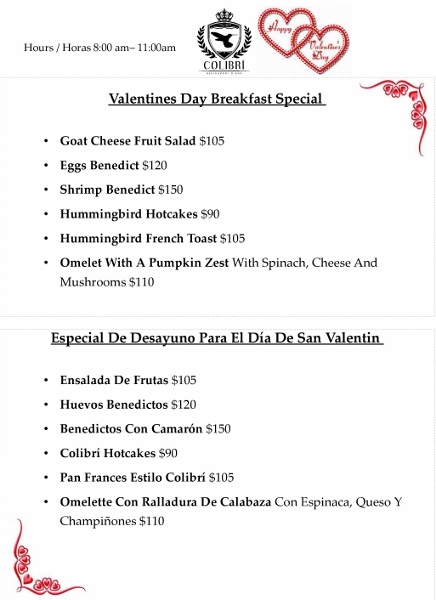 Click here for the special Breakfast menu. Or try Poblano Soup or Shrimp and Artichoke Salad for lunch. Click here for the special Lunch menu. And for dinner, feast on a Valentine’s Day 3-course Dinner. Includes a Welcome Cocktail and a glass of wine per person, and then your choice of entree. Click on the image on left for entree options. End the evening with a Chocolate Coulant with vanilla gelato. The cost for 2 people is 1700 pesos. Call 622-115-3466 for your reservations. 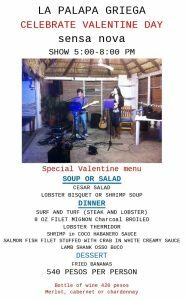 Delfines Bar and Grill is ready to serve you a special 3-course Valentine’s Day dinner. Click on the image to the left for the full menu and prices. Make your reservation by calling 226-0499. 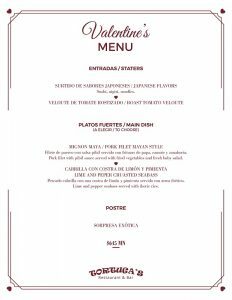 Celebrate your love on Valentine’s Day at La Bartina 64. 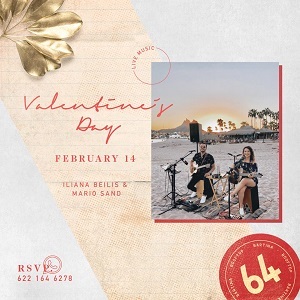 Enjoy the romantic sounds of Iliana Beilis and Mario Sand, performing live from 7:00pm – 10:00pm. 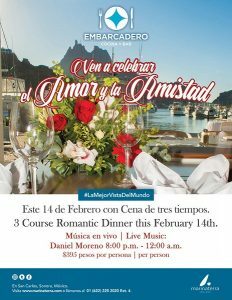 For your reservation, call or WhatsApp 622-164-6278. Club Deportivo will be serving prime rib with mashed potatoes, gravy, green beans, dinner roll, salad bar and dessert bar. Doors open at 4:30pm, and dinner is served at 5:30pm. After dinner, dance the night away with Sam Rainwater from 6:30pm to 8:00pm. The price is 300 pesos or $15 USD. Buy your tickets at Seaside Realty or in front of CiBanco (Mon – Fri, 9am – 12pm). 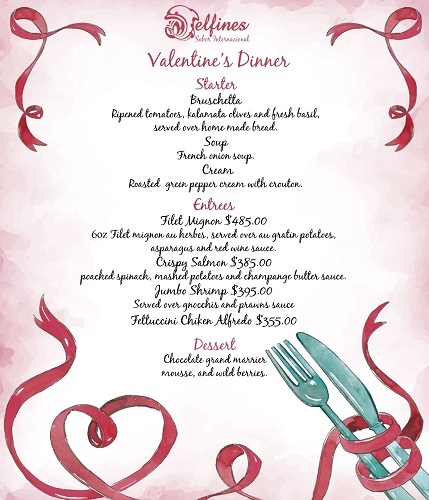 To reserve a table, call Marilyn at 226-1141. Please remember to bring your own tableware.